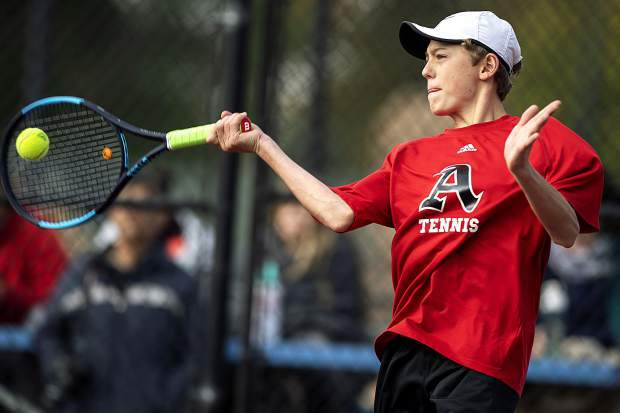 The Aspen High School boys tennis team had a strong first day at the Class 4A state tournament in Pueblo, which started five hours late after overnight rain left the courts too wet for play on Thursday morning. The Skiers saw all four of their doubles teams advance to the quarterfinals, while having one of their three singles players move on. The lone singles win came from No. 2 Christian Kelly. The sophomore won a tightly-contested 6-3, 4-6, 6-3 match over D’Evelyn freshman Phoenix Lee. Kelly will face Cheyenne Mountain junior Paul Jones in Friday’s quarterfinal. AHS senior Alex Ilic lost at No. 1 singles, falling 1-6, 6-2, 3-6 to Cheyenne Mountain junior Joey Geisz in the first round. At No. 3 singles, AHS sophomore Alex Mosher lost 6-4, 4-6, 4-6 to Dawson School senior Ryan Oliver. Aspen really stood out in doubles play on Thursday. At No. 1 doubles, George Ghali and Liam Sunkel cruised to a 6-0, 6-0 win over a duo from Pueblo Central, and will face Niwot’s Sam Keronen and Manas Saini in the quarters. Aspen’s No. 2 doubles team of Robert Holton and Lukee Tralins also rolled, winning 6-0, 6-2 over a duo from Thompson Valley. They will face Colorado Academy’s Nicholas Dietrich and Will Smart in Friday’s quarterfinals. At No. 3 doubles, Aspen’s Bryce Cordts-Pearce and Ben O’Brien won 4-6, 6-2, 7-5, while the No. 4 doubles team of Nolan Farrey and Ethan Godfrey won 6-1, 7-5. They will face Kent Denver and Mullen, respectively, in the quarterfinals. After the first round, Aspen is tied at fifth as a team with Mullen with five points. Colorado Academy, Kent Denver, Niwot and Cheyenne Mountain all have seven points for winning all seven of their first-round matches. Play continues Friday and is scheduled to end Saturday. The Basalt High School volleyball team lost a 3-1 match against visiting Roaring Fork on Thursday. The Rams won the first set 25-12, only to have the Longhorns rally with a 25-20 win in the second set to even the match. Roaring Fork was too strong from there, winning the third set 25-15 and fourth set 25-19 to take the match. The Rams improved to 8-7 overall with the win. They also beat Basalt on Sept. 18, that one by a score of 3-0. The Longhorns fell to 3-13 overall. BHS is next scheduled to play at Rifle on Tuesday. Both the Aspen and Basalt boys soccer teams were scheduled to play on Thursday, only to have both games called off because of the weather. Aspen (5-6) had been scheduled to play at Grand Junction, but instead will next host Grand Valley at noon on Saturday. Basalt’s key league contest against visiting Vail Mountain Thursday was pushed back a day. The teams will now play at 4 p.m. Friday in Basalt. At 4-1 in WSL play, the Longhorns are currently in a three-way tie for the league lead with Roaring Fork and Coal Ridge, two teams they have already beaten this fall. The Basalt cross country team had been scheduled to compete Thursday at a meet in Rifle, but that meet was also canceled because of the weather. The Longhorns will compete Oct. 19 at the regional meet hosted by Aspen High School at the Aspen Golf Club. The Skiers are scheduled to compete this weekend at the Montrose Relays. One week after rolling to a 41-0 win over Eagle Valley on homecoming, the Glenwood Springs High School football team made the trip Thursday to Stocker Stadium in Grand Junction to take on the Palisade Bulldogs in 3A Western Slope League action. The game started out well for the Demons, as Glenwood pulled to within one score at the half at 21-14, but saw the wheels come off in the second half as Palisade shut down Glenwood’s rushing attack after halftime, outscoring Glenwood 21-0 to pull away for a 42-14 win in league play. Trailing 14-0 after an early pair of touchdown runs by quarterback Cam Tucker — one of which was 51 yards — Glenwood pulled to within one score as senior Gavin Olson found his way into the end zone with 6:02 left in the second quarter, capping off a 14-play, 80-yard drive for the Demons. Palisade stretched its lead to 21-7 and had the ball late in the first half looking to pull away, but the Demons recovered a Bulldog fumble near midfield, setting up a 6-yard touchdown pass from Dylan Albright to Wyatt Ewer, making it a 21-14 game at the half. Looking to ride that momentum, the Demons came out for the second half and simply couldn’t get going offensively, allowing the Bulldogs to create some breathing room as Sebastian Campbell scored from 4 yards out, and Tucker rushed for a 1-yard score, making it a 35-14 game. The Demons tried to find a spark with Albright under center, as the junior hooked up with senior Max Lemkau through the air for a couple of highlight reel plays, but Glenwood couldn’t punch it in as Palisade came up with a couple of fourth-down stops. Jason Bruce capped off the win for Palisade with a 6-yard run late in the fourth quarter. Glenwood sits at 2-5 (1-1 3A WSL) on the season. The Demons travel to Battle Mountain Oct. 19 for a league matchup with the Huskies (5-1, 1-0 3A WSL).